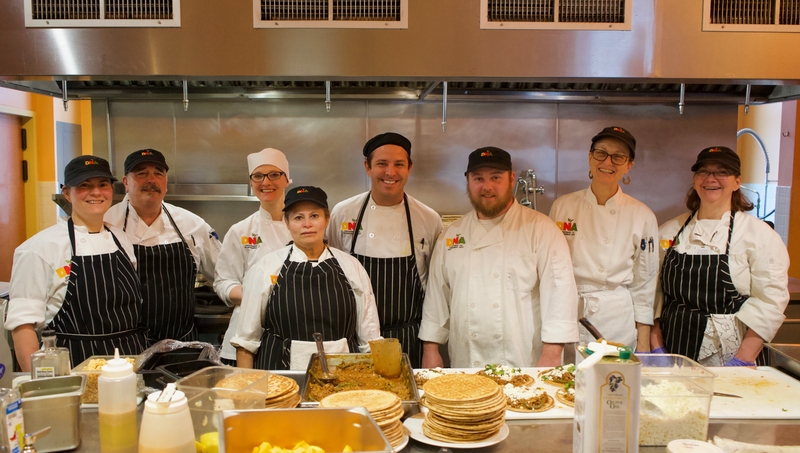 The DaVinci Master Chef program at The Center for Discovery invites acclaimed chefs from around the world to engage with our community here, and to volunteer their time to share their knowledge with our own team of chefs in our Department of Nourishment Arts (DNA). Through Chef Cesare Casella, Chief of DNA, this program brings together colleagues and masters in the culinary world, who are in awe of the use of fresh food as a therapeutic tool. Each year, our DaVinci Master Chefs visit The Center to teach their recipes based on the products from our Thanksgiving Farm, to our own DNA chefs. From there, our chefs learn the recipes and techniques taught by the master chef, which they take back to the residences to prepare the dishes in our very own kitchens. The result? Our culinary team enjoys an educational exchange with top chefs inspiring creativity and new skills. What’s more, each chef is encouraged to embrace our own food philosophy – Food is Medicine®, with their own interpretation. One such DaVinci Master Chef is Maria Loi, whose mission in life is simple – to change the world, one healthy, Greek bite at a time. Chef Loi, a world-renowned television chef and the author of more than 36 cookbooks and over 150 magazine editions, create recipes that inspire truth in flavor – a way of thinking derived from the warm, scented Greek air and the sounds of loved ones around the table. She owns an exquisite gourmet restaurant in idyllic Nafpaktos, along with Loi Estiatorio, her flagship restaurant in the heart of New York City. Maria Loi has been a long-term contributor to the DaVinci Master Chef program, participating in our annual Michael Ritchie Big Barn Event for nearly a decade and continuously demonstrates her support for the Center. We were honored to host and spend time with Chef Loi as she showcased her culinary expertise for our team of chefs, while cooking up a few of her mouthwatering recipes – like Fasolakia Moussakasi Me Pita (a Greek-style beef quesadilla), Kayana (scrambled eggs with feta and tomato), and Agouri Salata (cucumber salad). At an inaugural event, held on January 24th in our Carrus Café, we invited our entire staff to DaVinci Master Chef Series Presents: the Food of Maria Loi to taste Chef Loi’s insanely delicious recipes before they are officially rolled out on our seasonal menu for our residents to enjoy. And for all those interested in bringing Maria Loi’s authentic Greek cuisine into your own home, you’re in luck! She’s shared with us the three recipes that were filmed in her DaVinci Master Chef lesson – yes, the same recipes that our staff enjoyed and soon enough, that our residents will be delighted to taste! So go on, cook along with Maria Loi and become a master chef of your own! Yiasou! For more information about our Department of Nourishment Arts, or the DaVinci Master Chef Program, please contact Richard Humleker, Vice President of Development, at rhumleker@tcfd.org.